Should Facebook Be Spending So Much Cash on Buybacks? The social media giant won’t stop repurchasing its shares anytime soon. Facebook (NASDAQ:FB) recently disclosed a $9 billion increase to its stock buyback plan, which was initially authorized for $15 billion in repurchases in 2017. Facebook already spent $10.3 billion -- or 59% of its free cash flow (FCF) -- on stock buybacks over the past 12 months. That's equivalent to roughly 3% of Facebook's current market cap. During that period, Facebook's stock fell more than 20% due to ongoing concerns about its slowing growth, privacy and security issues, and management problems. Declines across the broader markets -- which were caused by trade tensions, rising interest rates, and other headwinds -- exacerbated the pain. Were Facebook's buybacks justified, or should it have applied that cash toward expanding its business? 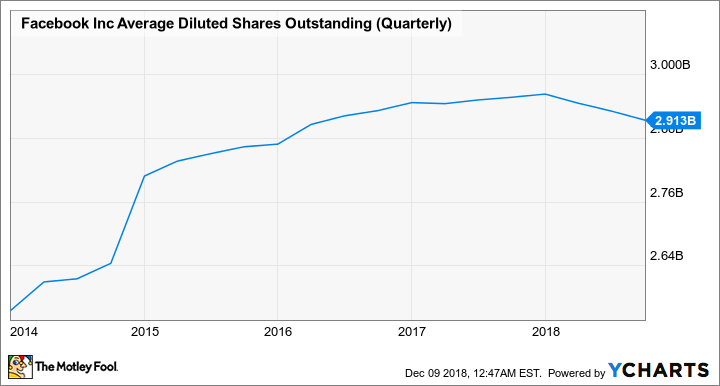 A company usually repurchases its shares for one or more of three reasons -- its stock becomes undervalued relative to its growth potential, it doesn't see any other compelling uses for its cash, or it wants to offset the dilution caused by share-based compensation. All three reasons apply to Facebook to some degree. First, Facebook currently trades at just 18 times forward earnings, which hovers near a historic low for the social media giant. However, analysts expect its earnings to rise just 2% next year, as its growth decelerates in its more profitable markets and it ramps up spending on better security measures and the expansion of its ecosystem. But over the next five years, analysts expect Facebook's earnings to grow at an average rate of 18% per year. This gives it a five-year PEG ratio of 1.1, while "undervalued" stocks generally have a PEG ratio of below 1. Therefore, Facebook's stock is historically cheap, but it can't technically be considered a "value" stock yet. Second, Facebook already significantly expanded its ecosystem with big acquisitions -- including its $1 billion takeover of Instagram, $19 billion takeover of WhatsApp, and $2 billion purchase of Oculus VR. Its 10-year plan mainly focuses on the expansion of those platforms -- along with its Messenger platform, Watch, Workplace, and Marketplace -- to lock in more users. Facebook could try to buy other social media companies, but the two obvious choices -- Twitter (NYSE:TWTR) and Snap (NYSE:SNAP) -- are both struggling to grow their user bases. That would contradict Facebook's strategy of buying high-growth companies prior to their public offerings. Snap's enterprise value of $7 billion makes it a more likely buyout target than Twitter, which has an enterprise value of $20 billion, but Facebook is already stealing away Snap's users with Instagram -- so it would be a redundant purchase. Therefore, repurchasing shares instead of spending billions on tough-to-monetize platforms (like Oculus) is a smart move. This doesn't mean that Facebook is repurchasing shares only to support stock bonuses. Other social media companies notably spend more cash on stock bonuses than Facebook -- Twitter and Snap's SBC expenses accounted for 12% and 43% of their revenues in their latest quarters, respectively. Instead, stock bonuses should simply be considered another reason -- along with the stock's low valuation and a lack of compelling investment opportunities -- for its buyback strategy. Stock buybacks can be considered a bullish sign if a company's insiders are also purchasing shares. But over the past 12 months, its insiders sold 55.7 million shares on the open market in 293 transactions, but only bought 50.1 million shares in 198 transactions. That ratio slightly favors the sellers, but investors should note that some of those sales were automated. Therefore, if Facebook's insider buying accelerates as the company repurchases more stock, it could indicate that its ailing stock is finally bottoming out. Facebook's buybacks make sense -- they'll tighten up its valuations and give investors more confidence in its long-term prospects. They certainly aren't a magic bullet for its other major problems, but they indicate that it might make more sense to buy Facebook than sell it at these levels.